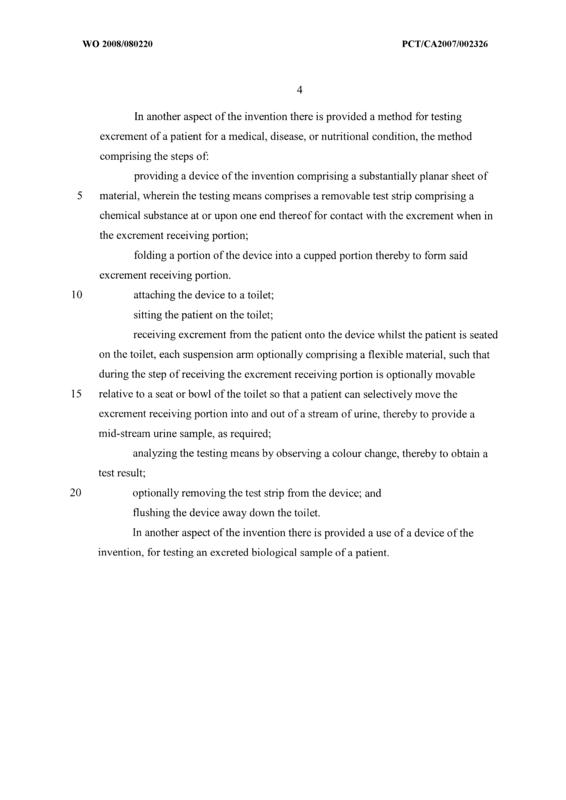 Disclosed herein are devices for mounting to a toilet, and for collecting and /or testing an excreted biological sample from a patient. 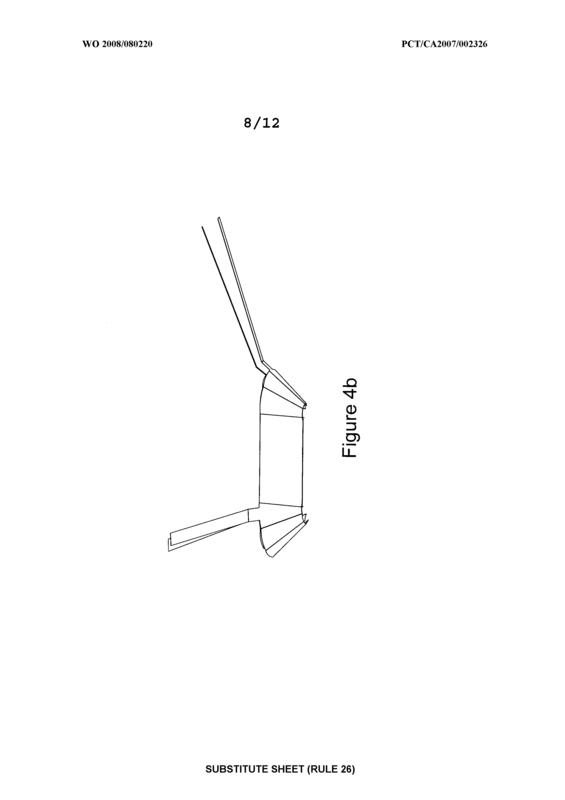 In certain exemplary embodiments, the devices may be comprised of a folded planar sheet of biodegradable, flushable material comprising a test strip for testing the sample very soon after excretion from the patient. 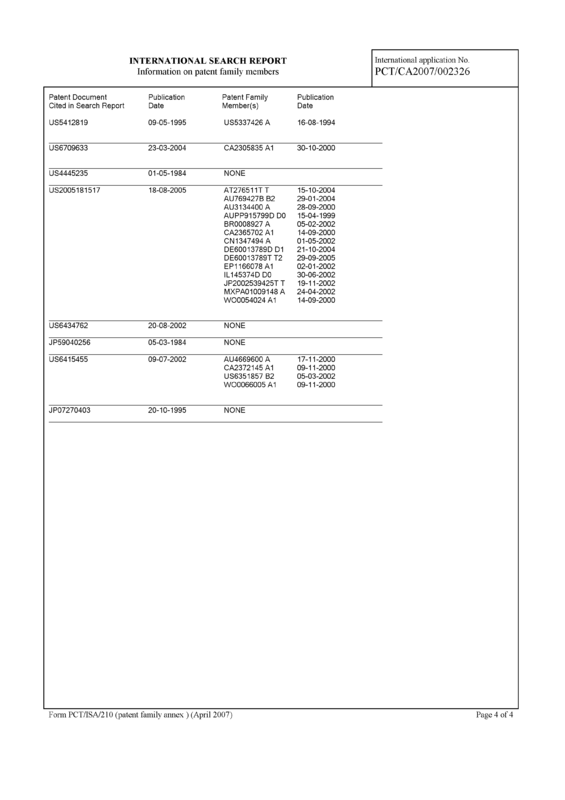 Also disclosed are methods involving the devices. 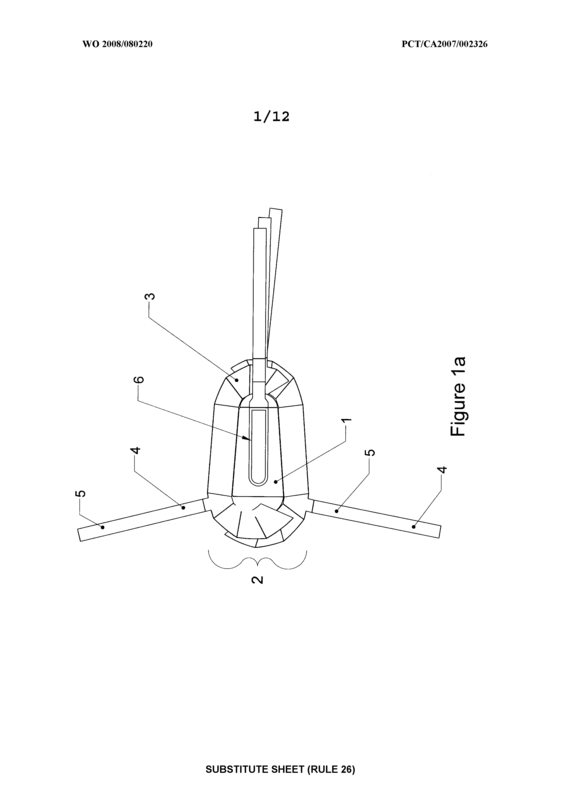 A device for collecting and / or testing excrement of a patient seated on a toilet, the device comprising: an excrement receiving portion for receiving said excrement from said patient prior to contact of said excrement with said toilet or water retained therein; at least two suspension arms each extending from the excrement receiving portion, each including attachment means at an end opposite said excrement receiving portion, for attachment to a seat or bowl of said toilet, thereby to retain the excrement receiving portion within or above the toilet to receive excrement, without contact with the toilet, toilet bowl, or water retained therein; and optionally at least one testing means positioned to contact the excrement when received in the excrement receiving portion. 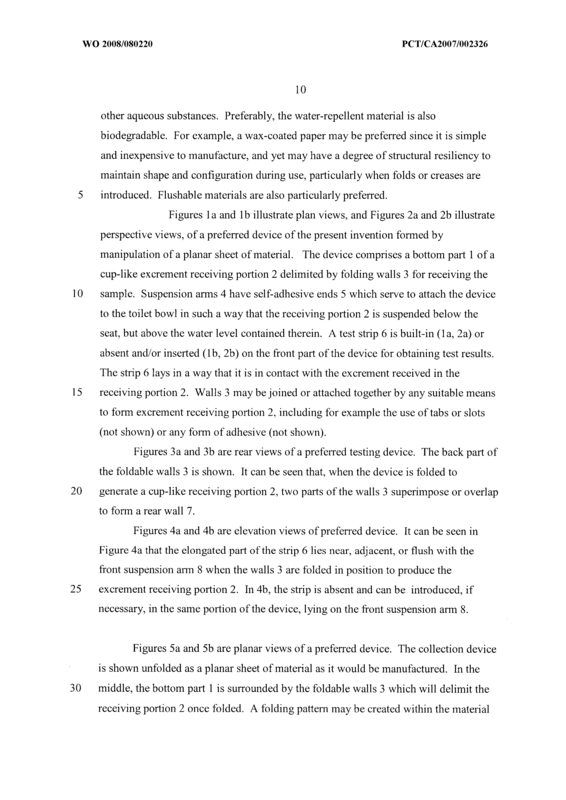 The device of claim 1 , wherein the device comprises a substantially planar sheet of material, a portion thereof being foldable into a cupped portion thereby to form said excrement receiving portion. 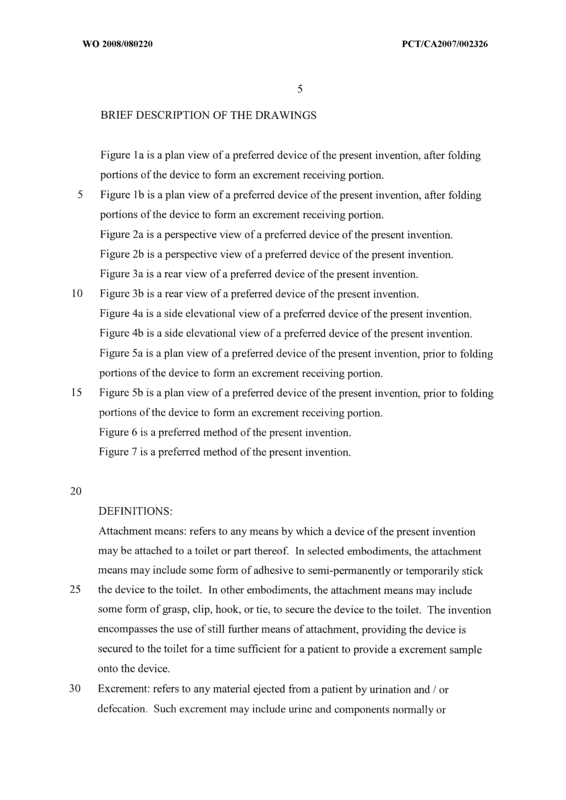 The device of claim 2, wherein prior to use the device is substantially planar such that a plurality of said devices can be flat-packed for transportation and / or storage. 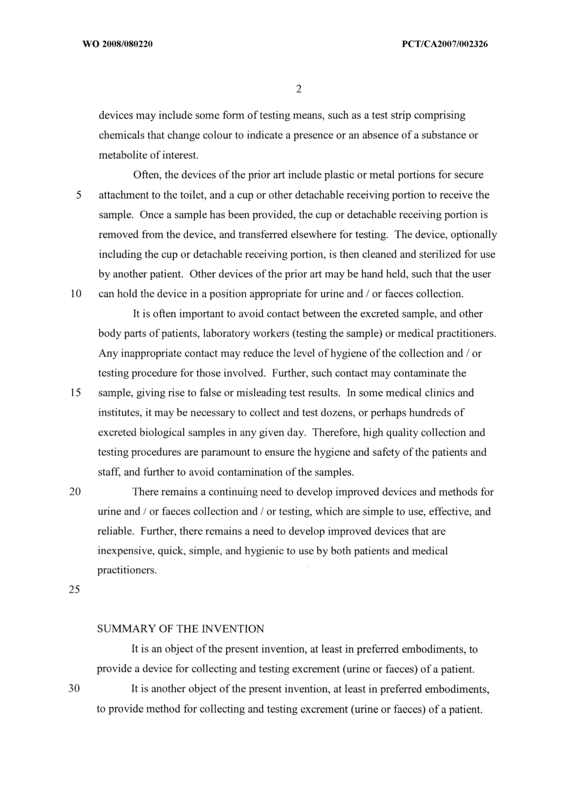 The device of claim 1 , wherein the at least one testing means comprises a test- strip comprising a chemical substance at or upon one end of the test-strip for contact with the excrement when in the excrement receiving portion. 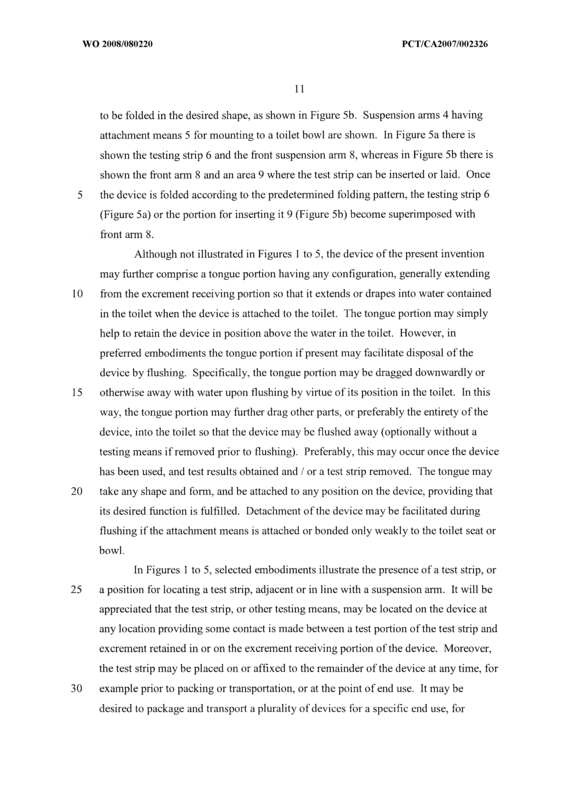 The device of claim 4, wherein the test strip is selectively removable from the device. 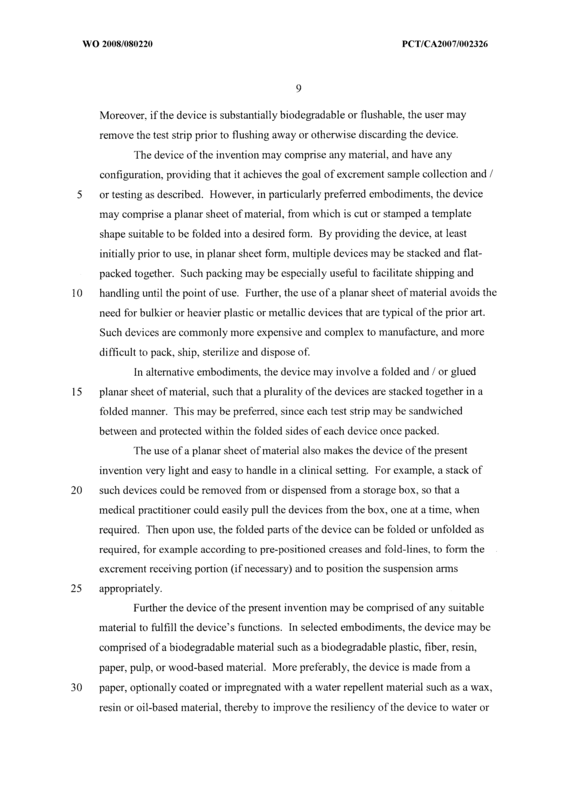 The device of claim 2, wherein the device comprises a biodegradable material. 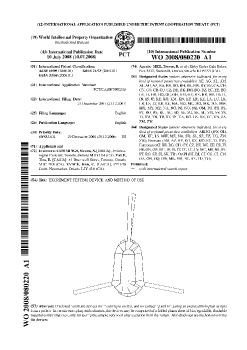 The device of claim 6, wherein the devices comprises paper, pulp, or plastic, optionally with a wax or resinous coating. 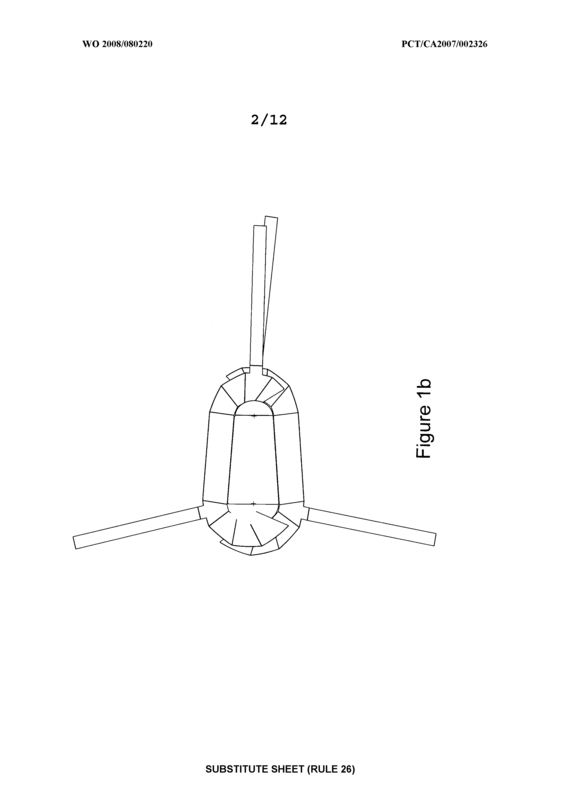 The device of claim 6, wherein the device is flushable. 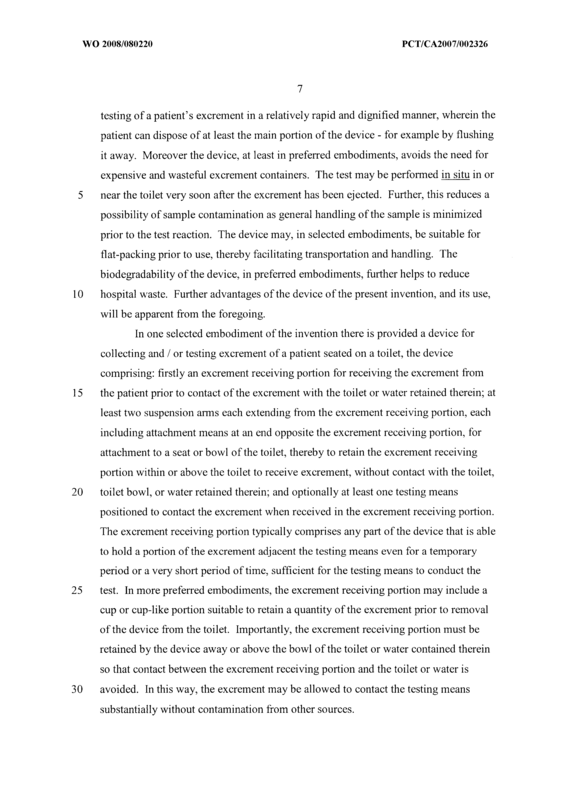 The device of claim 8, further comprising a tongue portion extending from the excrement receiving portion, such that upon attachment of said device to a toilet at least a portion of said tongue portion drapes into water retained in said toilet, so that flushing of said toilet draws said tongue portion and all of said device into said toilet to be flushed away. 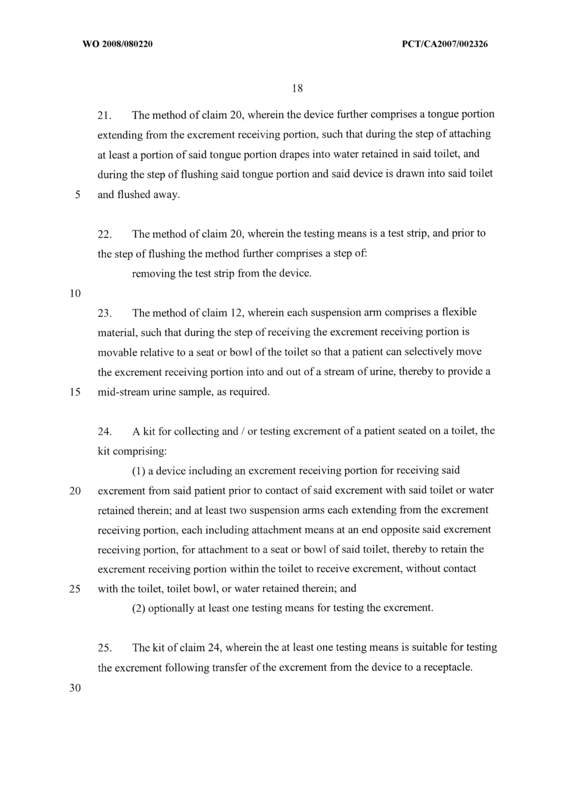 The device of claim 9, wherein the testing means is a test strip removable prior to flushing away of said device. 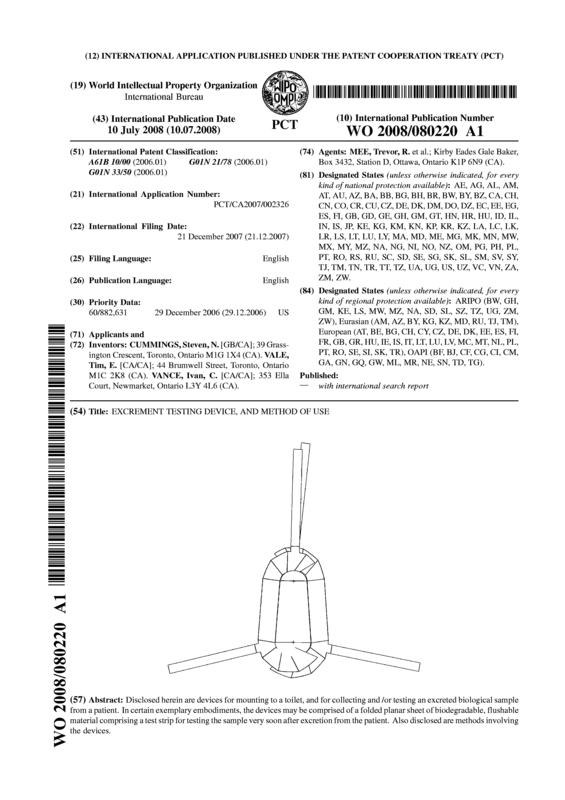 The device of claim 1 , wherein each attachment means includes a non- permanent adhesive such that each of said suspension arms may be selectively attached to said toilet seat or bowl, and selectively detached from said toilet seat or bowl prior to or during disposal or flushing of said device. 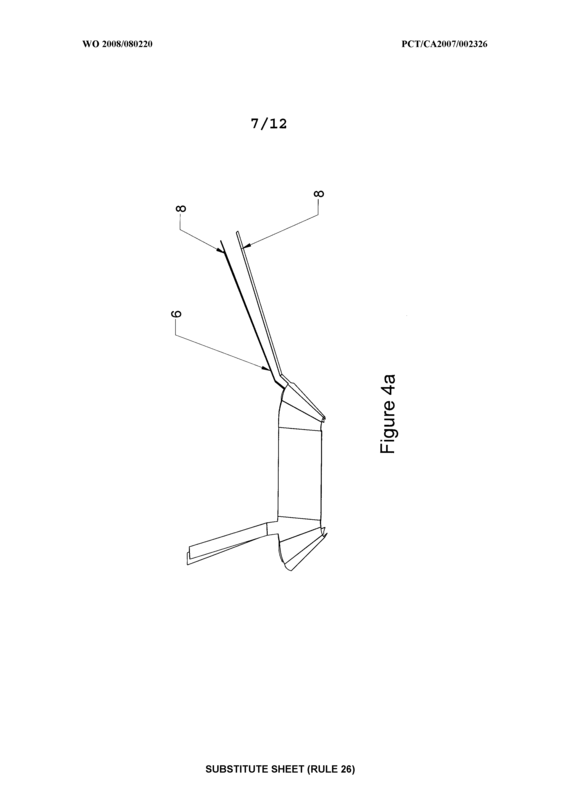 The device of claim 1, wherein each suspension arm comprises a flexible material, such that following attachment of the device to a toilet the excrement receiving portion is movable relative to a seat or bowl of the toilet so that a patient can selectively move the excrement receiving portion into and out of a stream of urine, thereby to provide a mid-stream urine sample, as required. 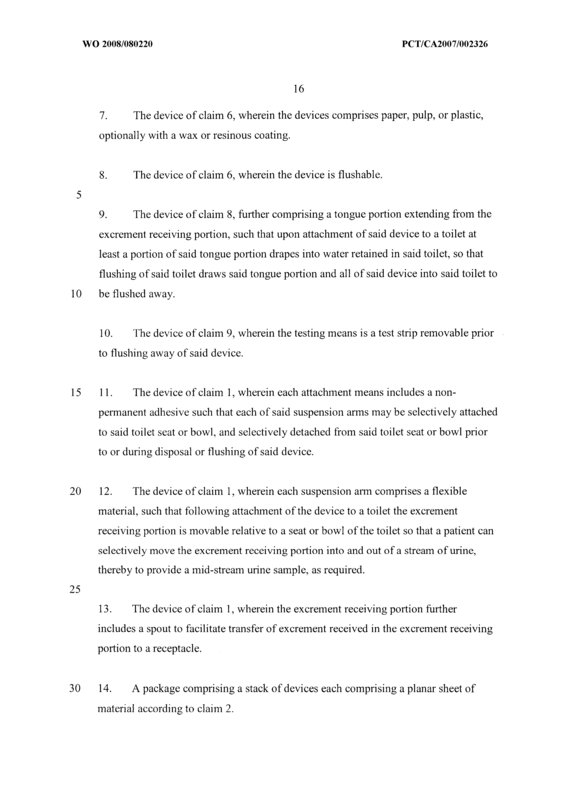 The device of claim 1, wherein the excrement receiving portion further includes a spout to facilitate transfer of excrement received in the excrement receiving portion to a receptacle. 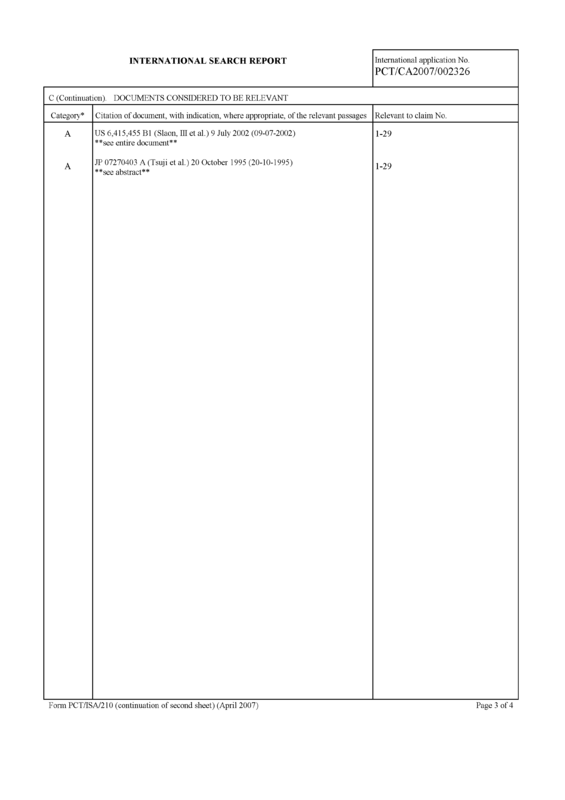 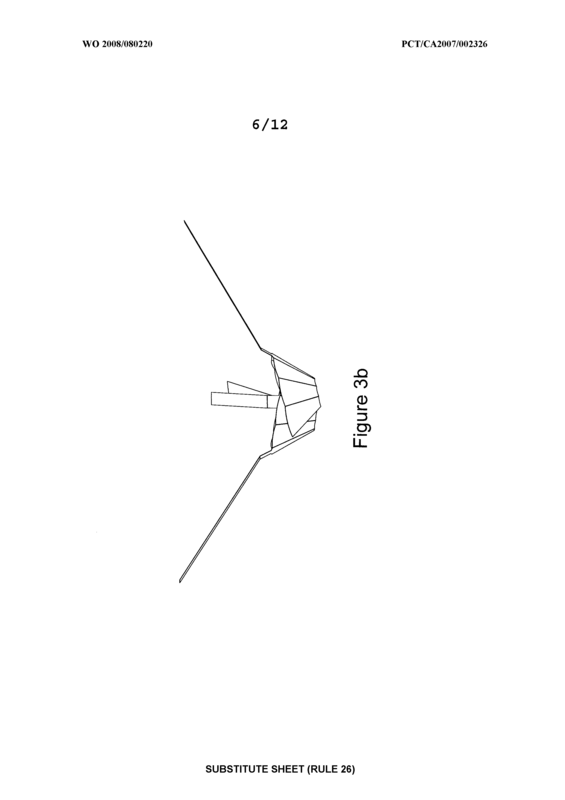 A package comprising a stack of devices each comprising a planar sheet of material according to claim 2. 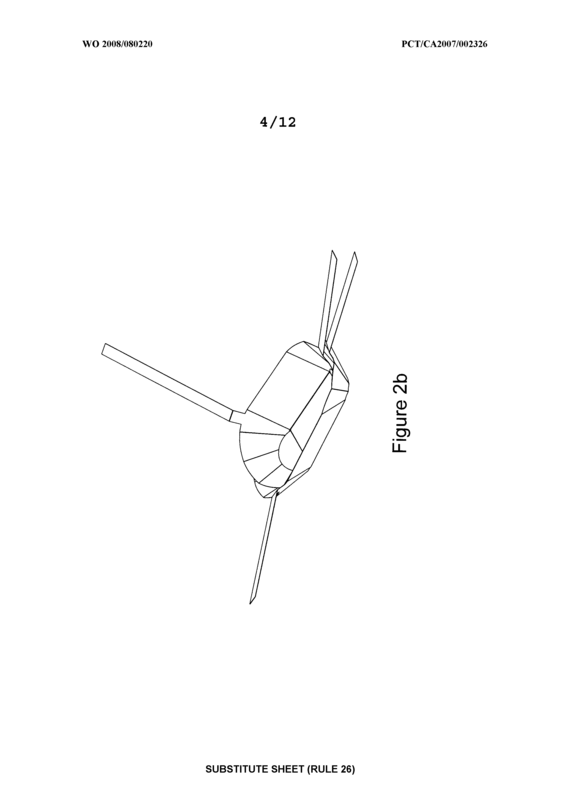 The package of claim 14, wherein prior to stacking, the devices are folded thereby to form a stack of folded devices, each optionally comprising a test strip sandwiched and protected by the folded portions. 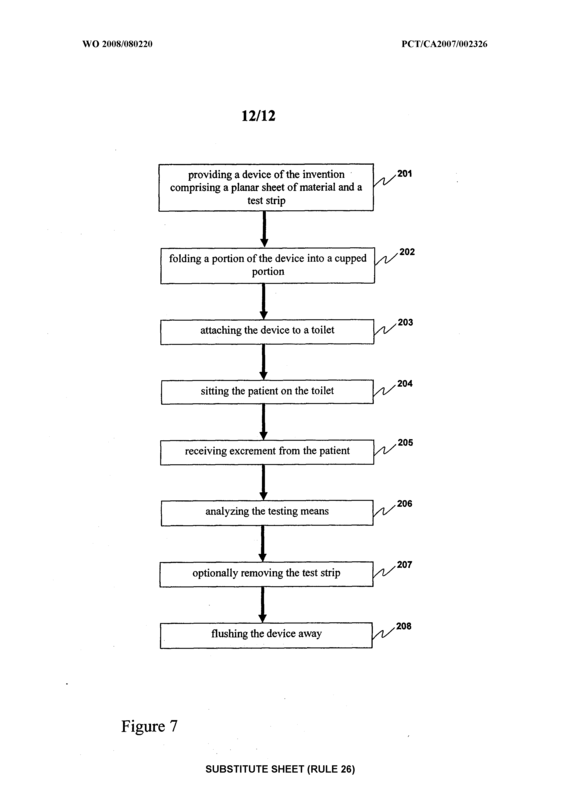 A method for collecting and / or testing excrement of a patient for a medical, disease, or nutritional condition, the method comprising the steps of: attaching a device of claim 1 to a toilet; sitting the patient on the toilet; receiving excrement from the patient onto the device whilst the patient is seated on the toilet; optionally analyzing the testing means to obtain a test result. 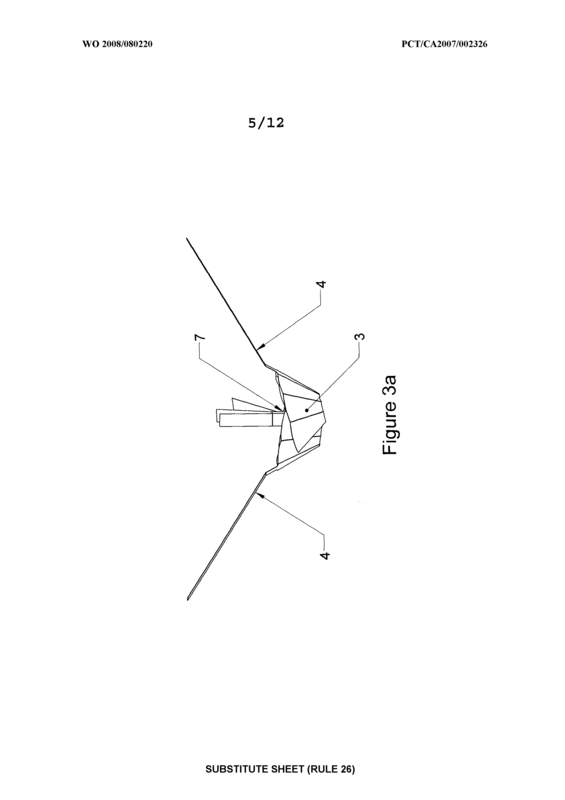 The method of claim 16, wherein the device comprises a planar sheet of material, the method further comprising an initial step of: folding a portion of the device into a cupped portion thereby to form said excrement receiving portion. 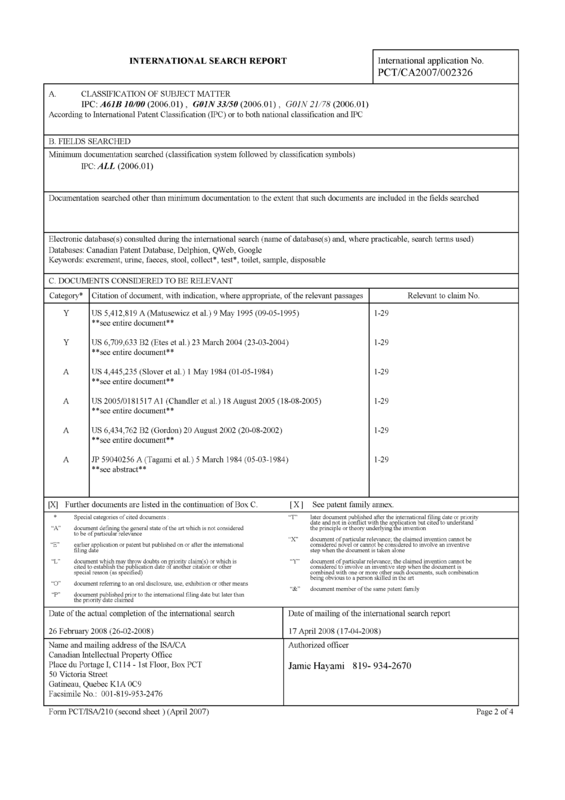 The method of claim 16, wherein the testing means is a test-strip comprising a chemical substance at or upon one end of the test-strip for contact with the excrement when in the excrement receiving portion, the step of analyzing comprising observing a colour change on the test strip. 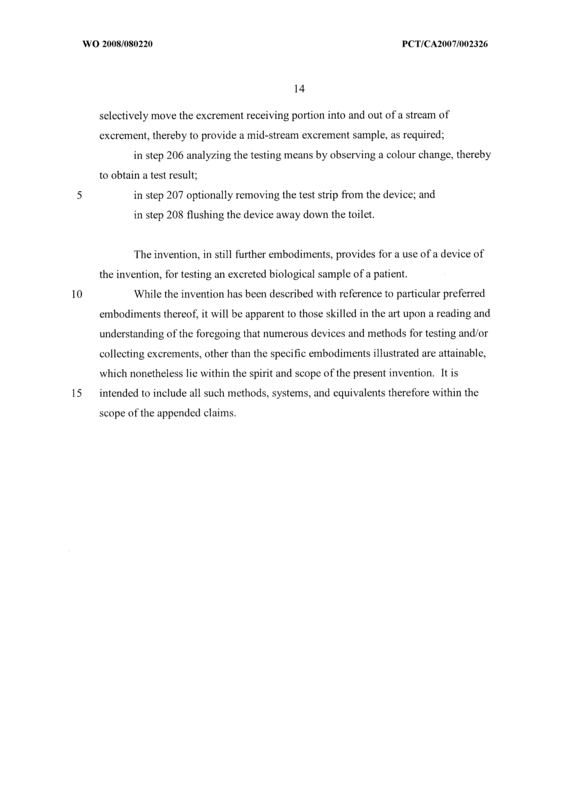 The method of claim 18, further comprising the step of: removing the test strip from the device. 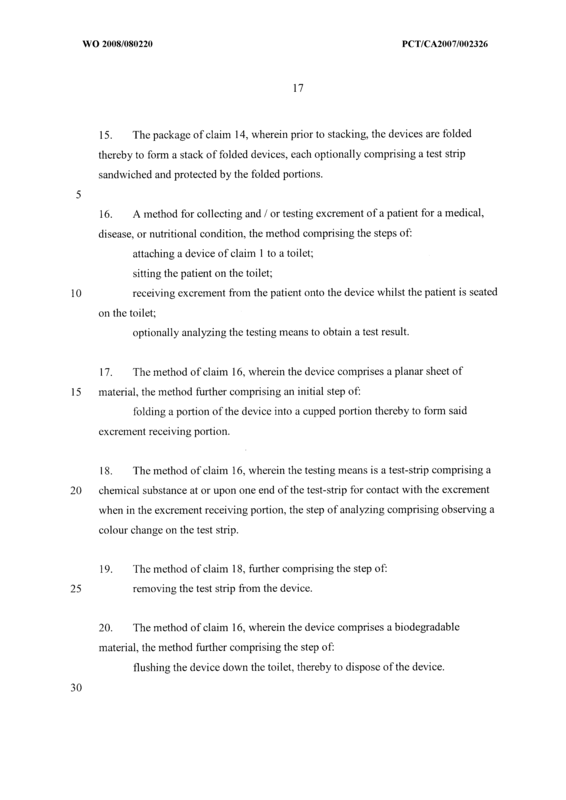 The method of claim 16, wherein the device comprises a biodegradable material, the method further comprising the step of: flushing the device down the toilet, thereby to dispose of the device. 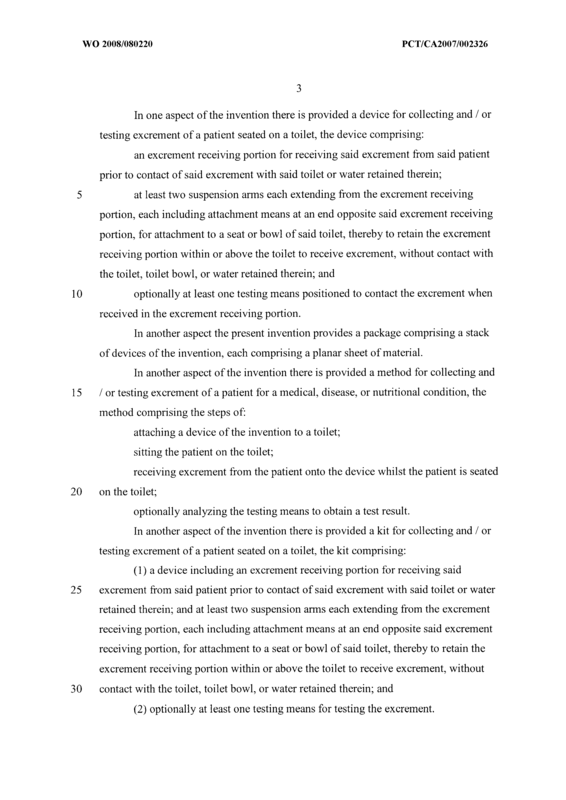 The method of claim 20, wherein the device further comprises a tongue portion extending from the excrement receiving portion, such that during the step of attaching at least a portion of said tongue portion drapes into water retained in said toilet, and during the step of flushing said tongue portion and said device is drawn into said toilet and flushed away. 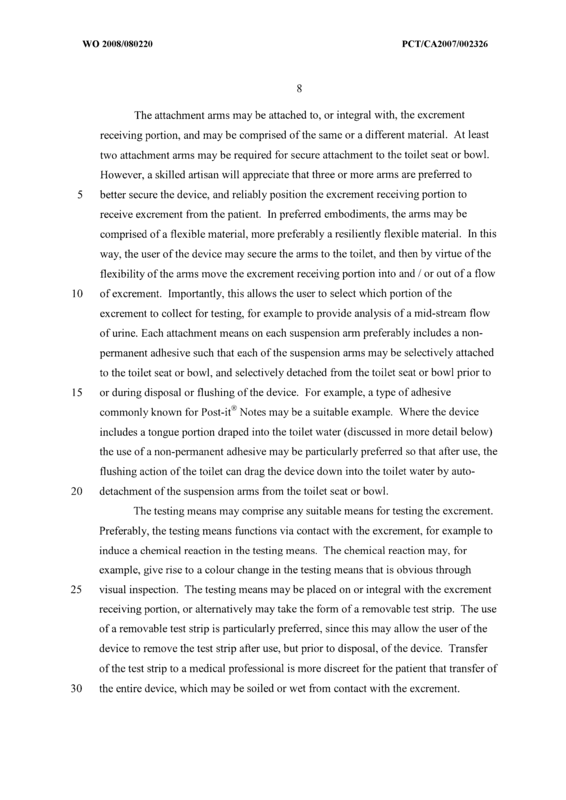 The method of claim 20, wherein the testing means is a test strip, and prior to the step of flushing the method further comprises a step of: removing the test strip from the device. 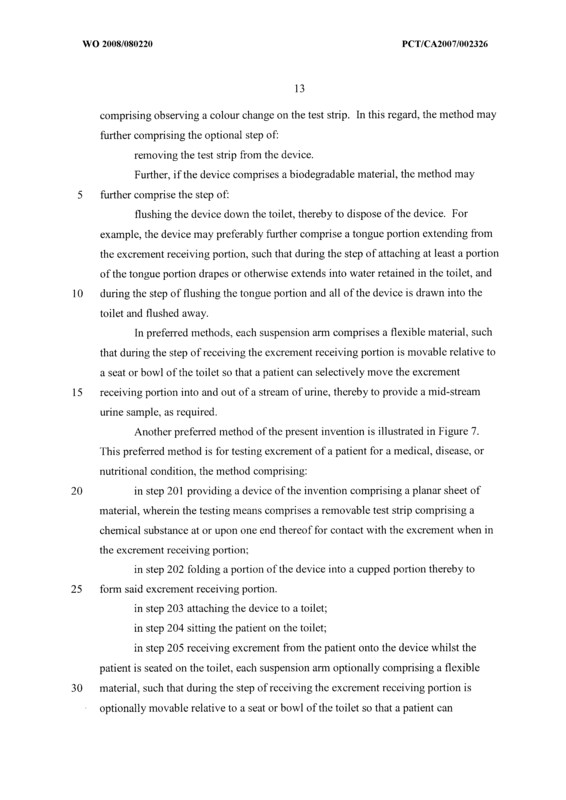 The method of claim 12, wherein each suspension arm comprises a flexible material, such that during the step of receiving the excrement receiving portion is movable relative to a seat or bowl of the toilet so that a patient can selectively move the excrement receiving portion into and out of a stream of urine, thereby to provide a mid-stream urine sample, as required. 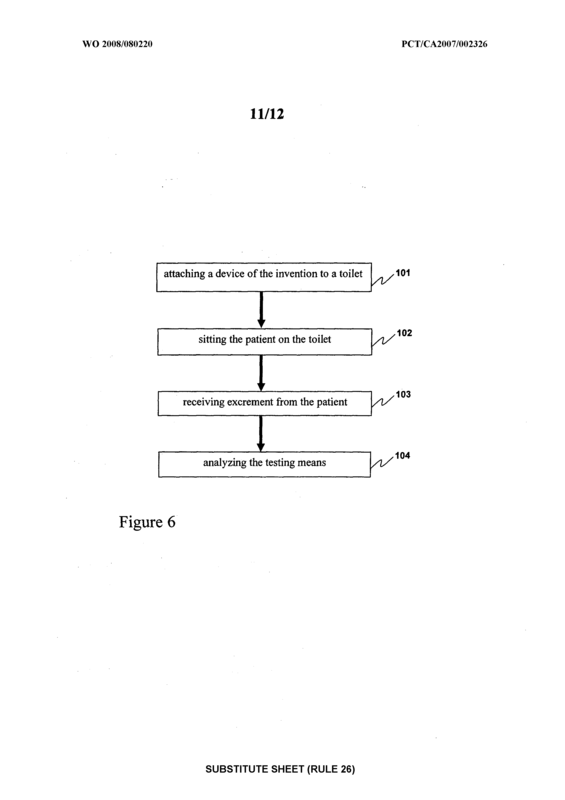 (2) optionally at least one testing means for testing the excrement. 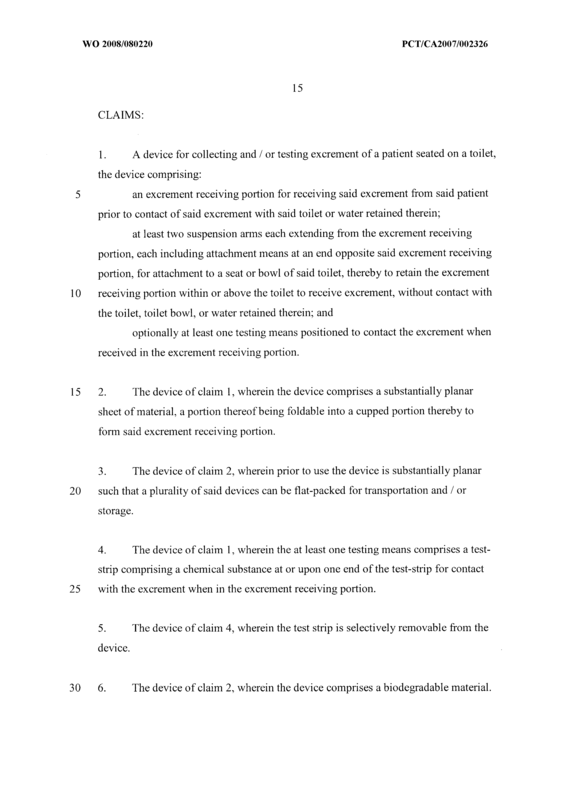 The kit of claim 24, wherein the at least one testing means is suitable for testing the excrement following transfer of the excrement from the device to a receptacle. 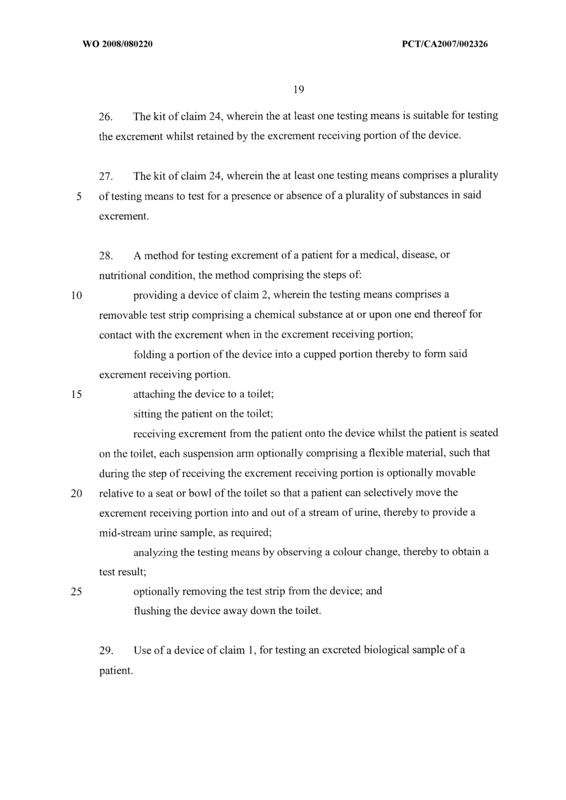 The kit of claim 24, wherein the at least one testing means is suitable for testing the excrement whilst retained by the excrement receiving portion of the device. 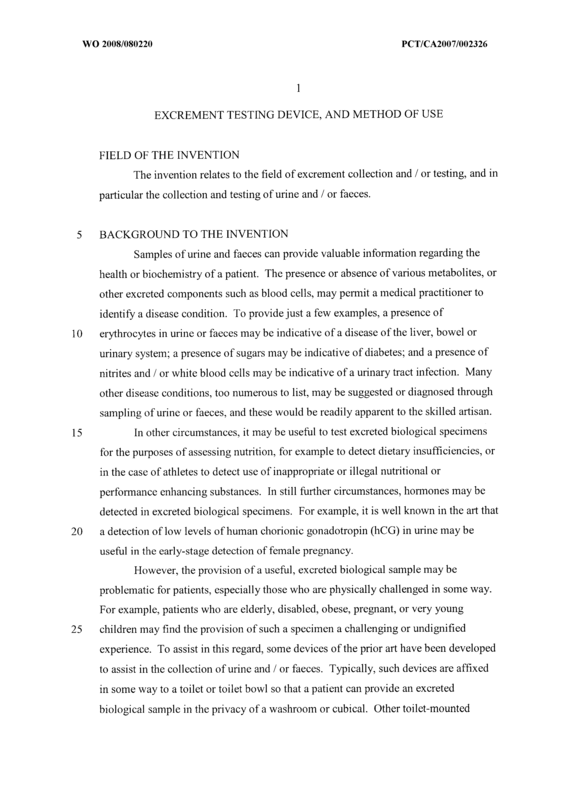 The kit of claim 24, wherein the at least one testing means comprises a plurality of testing means to test for a presence or absence of a plurality of substances in said excrement. 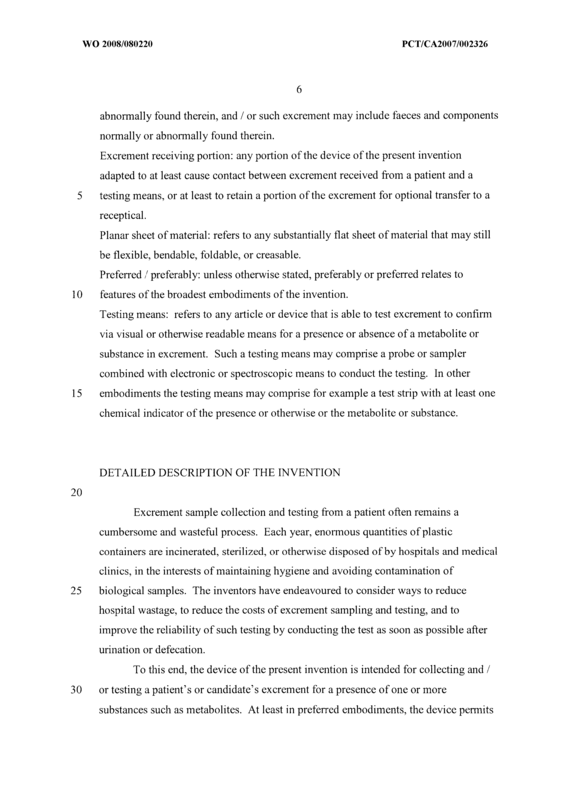 A method for testing excrement of a patient for a medical, disease, or nutritional condition, the method comprising the steps of: providing a device of claim 2, wherein the testing means comprises a removable test strip comprising a chemical substance at or upon one end thereof for contact with the excrement when in the excrement receiving portion; folding a portion of the device into a cupped portion thereby to form said excrement receiving portion. 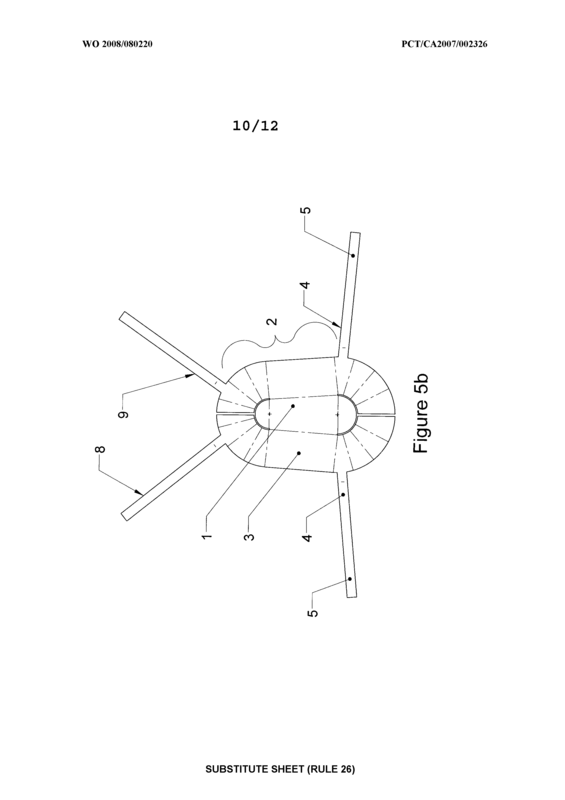 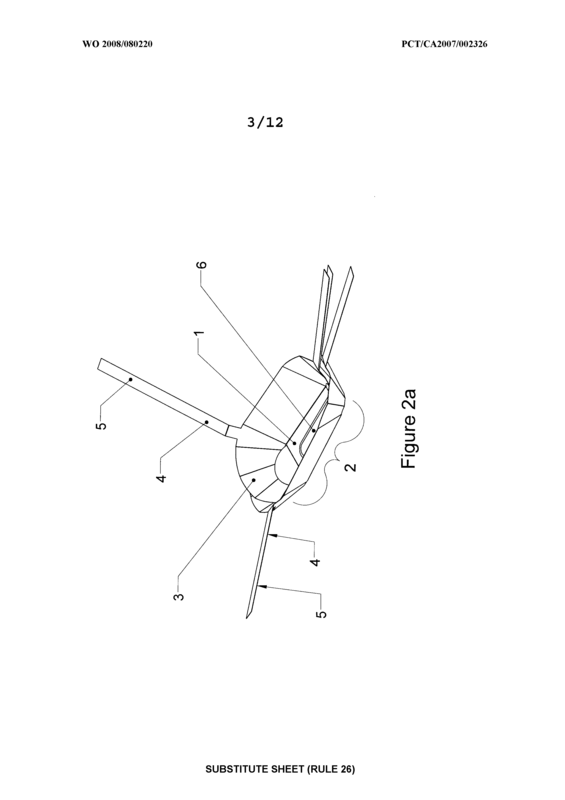 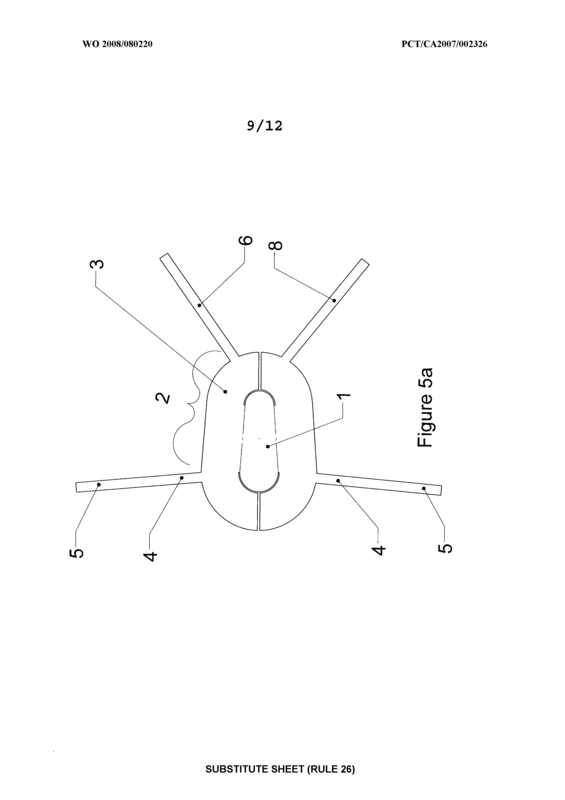 attaching the device to a toilet; sitting the patient on the toilet; receiving excrement from the patient onto the device whilst the patient is seated on the toilet, each suspension arm optionally comprising a flexible material, such that during the step of receiving the excrement receiving portion is optionally movable relative to a seat or bowl of the toilet so that a patient can selectively move the excrement receiving portion into and out of a stream of urine, thereby to provide a mid-stream urine sample, as required; analyzing the testing means by observing a colour change, thereby to obtain a test result; optionally removing the test strip from the device; and flushing the device away down the toilet. 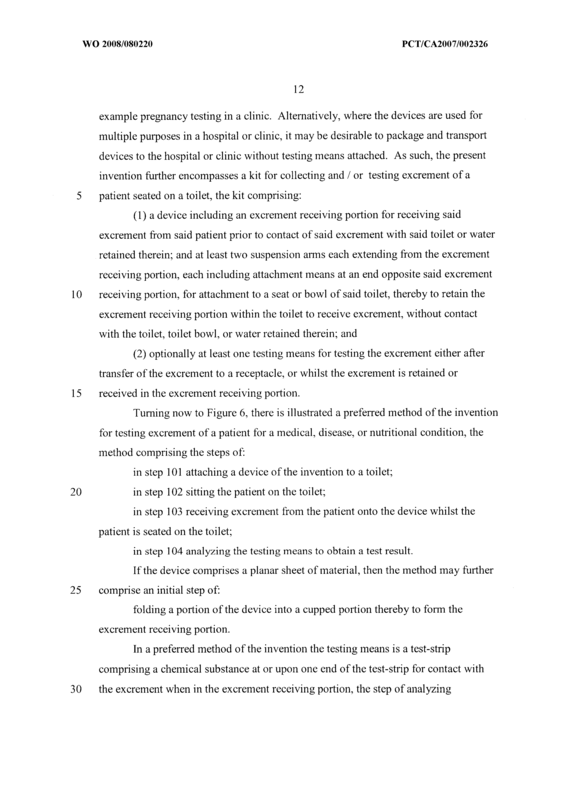 Use of a device of claim 1, for testing an excreted biological sample of a patient.